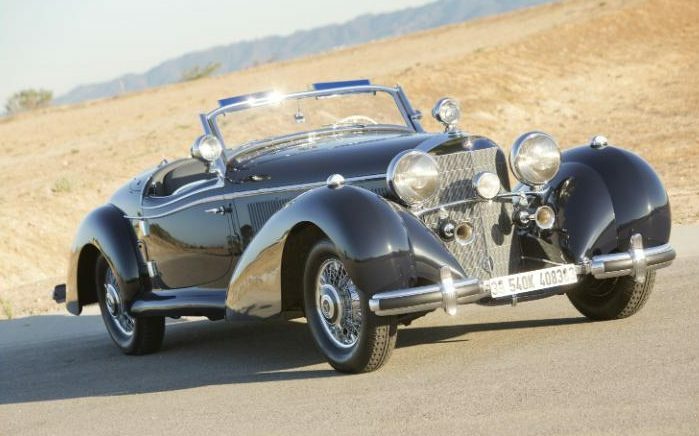 A classic Mercedes-Benz built as Europe teetered on the edge of war has been auctioned in Arizona for $6.6m, roughly £5.4m. The one-off 540 K Special Roadster has been accurately restored and was the highlight of a sale in Phoenix, which also included a low-mileage 2003 Ferrari Enzo, a 2013 Bugatti Veyron Super Sport, and a 2008 Lamborghini Reventón. The Mercedes is believed to have been hidden from the Nazis and smuggled out of the Soviet Union. It may even be the last example of this model made before the outbreak of the Second World War. At 17.5ft long and with a 5.4-litre engine, it’s very much a product of its time, but a restoration in 2012 means it doesn’t show its considerable age. “Our Arizona sale is consistently a bellwether for the collector car market, setting the pace for the auction season to come,” says Ian Kelleher, Managing Director of RM Sotheby’s West Coast Division. “This year’s top ten sales clearly indicate that demand for modern supercars remains strong, while exceptional pre-war classics—such as the 540 K—anchor the strength and resilience of the market. “When it comes to specific marques, four decades of Ferrariproduction were represented in our catalogue, from the 400 Superamerica through to the Enzo, each of which attracted multiple bidders and achieved impressive results – a reflection of their outstanding provenance, restorations and condition.